« Which Industrial Wireless is Best for Me? When I talk to customers about Honeywell X-Series paperless recorders, this is their first question. The quick answer is: It depends on what tasks the recorder needs to be able to do. But before I get into that, let’s look at what this credit system thing does and why Honeywell switched to it on the X-Series. On earlier products, like the Trendview series paperless recorders, if you wanted to turn on a firmware option, you had to change the PROM. Changing PROM had its hassles: delivery issues, disassembling the instrument to install the PROM, what happens in the process while your instrument is out of service during the install, and the inevitable ‘bent pin’ snafu. And after you upgrade the firmware, there’s another problem. When you bought the device, there was a 19-digit part number printed on the side of the enclosure. After the upgrade, that label no longer reflects what’s really in your instrument. So, when you try to reorder the same instrument, you move back to Square 1. This has the advantage of on-site enabling of firmware options and the flexibility to change options when the recorder’s installed. The downside is figuring out how many credits you need. But not to worry. 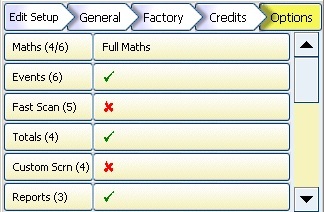 If you don’t buy enough credits when you order your recorder, you can add more later without much trouble. Some credits are essential to performing the task(s) the recorder is purchased for. For instance, if you want to send an e-mail from the recorder in the event of an alarm, you need enough credits to turn on the email option. Others options bring value to those who use the recorder’s data, like the Remote View option that lets people view the recorder screen from their desktop computer through a web browser. I consider five credits to be the minimum needed for basic use and troubleshooting the X-Series recorders. With these five credits, you can turn on Health Watch/maintenance and Remote View functions. Recorders are considered by most as capital equipment, and have a 10 year expected life span. The maintenance option provides valuable data that is useful for commissioning and troubleshooting. Remote view is universally useful in today’s environment where everyone has a desktop computer on the company’s network. Multiple people (quality, materials management, operations, scheduling) can see the recorder screen from their PC’s web browser without costly licenses or wiring. I recommend 15 credits for general data logging, when you’re not sure how the recorder will be used beyond basic data logging. People often forget to get credits for extra pens for totalizers and the Modbus Master. The totalized value from the totalizer and data read by the Modbus Master have to go somewhere; they goes into extra pens. Depending on the recorder model, two firmware credits provide between 12 and 48 extra pens. Most of the other options speak for themselves. See the full list of X-series recorder firmware credits at Lesman.com, my company’s website. This entry was posted on September 9, 2011, 2:03 pm and is filed under Configuration, Honeywell, Paperless Recorders, Recorders, Trendview X-Series Paperless Recorders. You can follow any responses to this entry through RSS 2.0. You can leave a response, or trackback from your own site.